#Review Hoka Tor Speed: why the hell would you wear boots to run? Here’s why! Waterproof, grippy, elevated, Hoka and boots – are these the shoes you’ve been looking for? I bought these with the specific reason of being able to run through the snow in Finland but it turns out they might be good for lots more than that. What do Hoka say about them? Named after the Tor Des Geants, a 330km mountain race across the Italian Alps with 3 Everests-worth of ascent, the Men’s Hoka Tor Speed WP is the lightest trail running shoe to offer ankle stability with aggressive Vibram grip. The first thing you’ll notice is how light they are considering the size – the boot gives them a look of bulk that they don’t deserve because the Tor Speed when on your feet are a good close fitting shoe that you feel nicely locked into. As a fan of the oversized shoe (see my general love of all things Altra) I knew what I was getting when I bought these – it was not going to be a minimalist shoe. On the visual end of things the Tor Speed is okay, black and red aren’t really daring enough for me – I’d rather that if you’re going to make a ridiculous running shoe then make it properly ridiculous – no messing around. However, that said they’ve grown on me much more than the Stinson ‘white’ ever did. Testing Before they went to Finland I gave them about 40 miles of testing to bed them in. I’ve generally found with Hoka that my feet need a little bit of time to adjust to them but the Tor Speed were comfortable from the moment we hit the trails together. We banged up and down some muddy hills and I was happy to note that I had good grip on the ground, very little slipping – my foot was stable in the shoe and importantly my feet were dry despite the conditions being rainy. I took them into the city and did a few short urban trail runs and these too were comfortable affairs. Bootiness Let’s not beat around the bush – these runners are boots and not running shoes, you’d think they have more in common with hiking boots but they really don’t. They simply feel like a properly bombproof runner. They won’t be for everyone but Hoka (and soon Altra) have a boot based running footwear option that will appeal to a certain market. Finland Testing I put another 60km (ish) on the Tor Speed during my visit to Luosto in Finland. 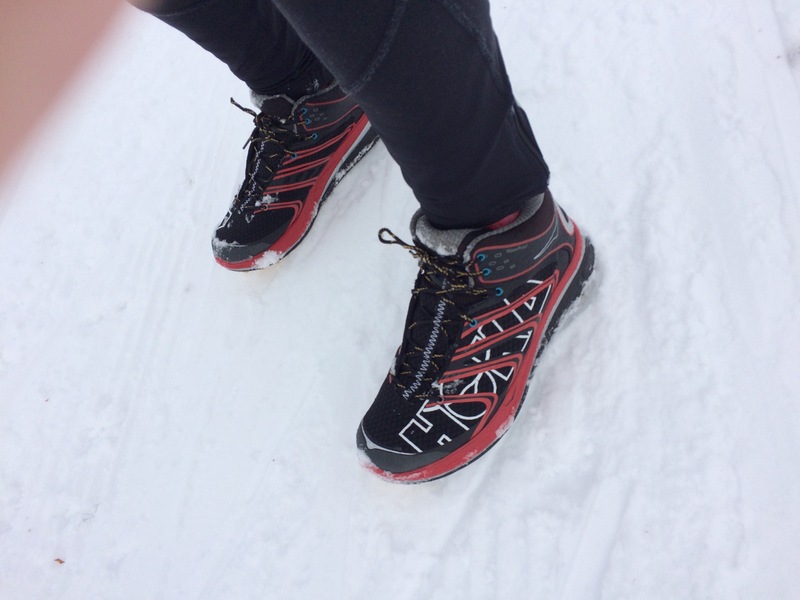 I decided that I wasn’t going to go snow-shoeing, I was going to see how the Hoka handled smooth, deep, icy, slushy, hilly, flat, etc, etc, trails and I quickly got my answer. On the XC ski trails the Hoka performed well, the grip held well and I could race around pretty much as I wanted. 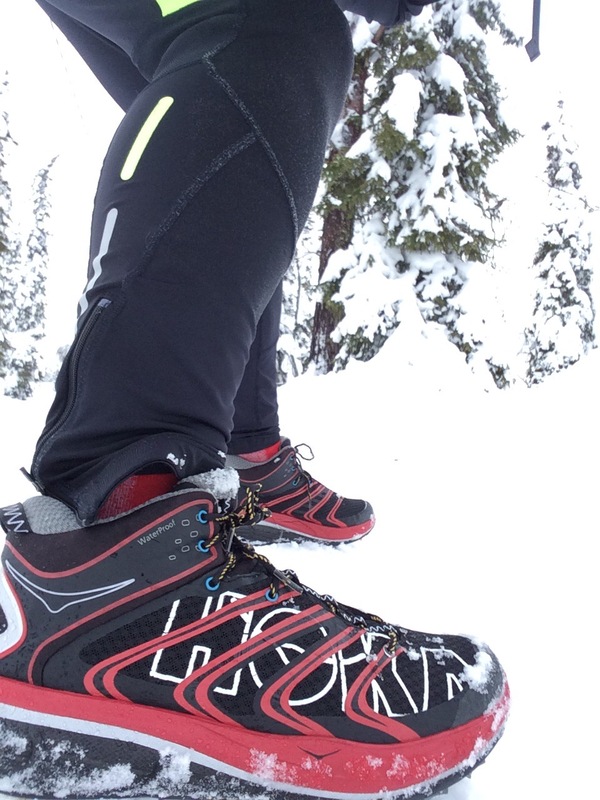 My feet were never cold and the combination with drymax socks was a winner, even when they dug into the deeper snow the Hoka retained their ability to get me out of trouble and unlike other Hoka I’ve used my ankles never felt at risk of going over. On the icier and slushier road they reacted the same as on normal Tarmac – they ate it up but it was when I hit the trail and decided to go ‘wild’ that they would have a real test. Thicker and thicker snow greeted my feet, legs getting trapped in the thigh height snow and much colder as you went higher and higher but never once did they fail and my feet remained dry. Yes I dusted off excessive snow after I’d dug myself out of various holes but ultimately my Tor Speed were a great choice of footwear. Uphills and downhills I expected to be a little less comfortable than say my Altra Lone Peak 2.5 but actually they were fine for undulating trails and once you gotten used to the feeling of them you’ll simply forget you’ve got boots on at all. So what are they for? I’ll be using them for the first sections (and possibly the whole) of the Skye Ultra Trail in May – so I’m happy that you can use them for ultra running but things like fast packing, hiking and geocaching will be right at the heart of the type of activity they were built for. Would I recommend these? The answer is, of course, yes but with the caveat that they aren’t for everyone and they aren’t for every activity. Plus as Hoka they’re quite expensive usually retailing for over £100 but if you find them on sale they might be worth a punt as an option for a waterproof shoe where sprinting isn’t going to play a large part in the day. Would I buy them again I suppose I’d the litmus test? And yes I would, I’ll be looking for a second pair for my winter running but despite really getting into the groove with them they won’t replace the Altra as my shoe of choice for racing. 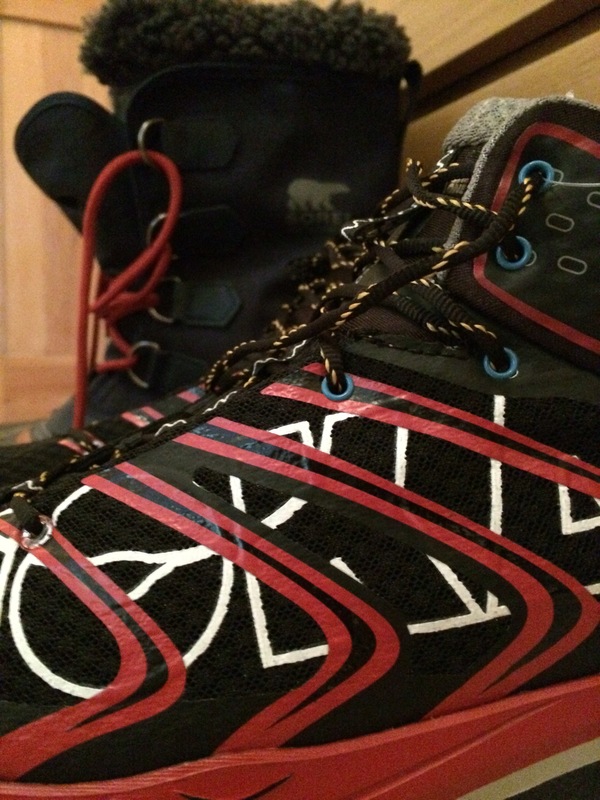 For a proper Hoka hiking boot you could look at the Tor Ultra which is a more traditional boot.